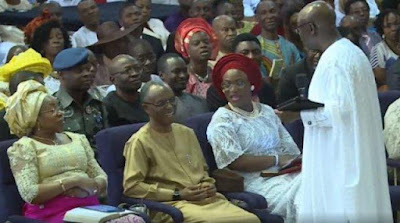 Controversial Pastor Tunde Bakare received his “Paddy Of Life”, the Governor of Kaduna state, Nasir El Rufai at his church in Ogba area of Lagos state yesterday. 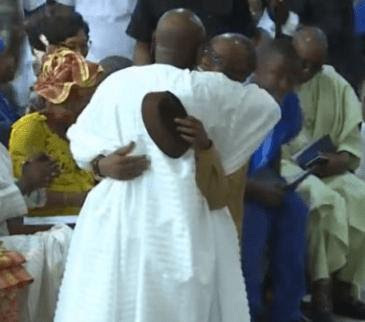 Just as he did last year, Bakare allowed his church members to give highly controversial El-Rufai a standing ovation as he gave him a big hug before he continued his sermon. 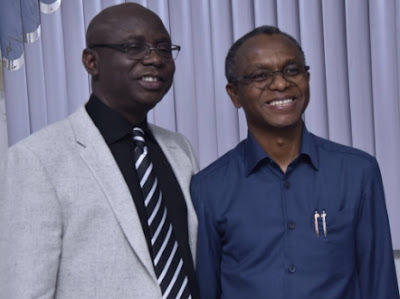 Due to Bakare’s recent declaration to run for the Presidency, many believed he will pick El-Rufai as his running mate. This sounds funny how can you do two things at a time? Being a pastor and a president, anyways the two starts with letter ‘P’ Time will tell. Where is it written you cannot do the two at the same time. He is first a Nigerian before a pastor. Unfortunately, this was how Buhari romanced Bakare and the church, got what he wanted and showed his true colour. The same thing will play out with El-rufai. PASTOR TUNDE, please quickly run away from that Serpent you called your mock running mate. Have you forgotten so soon about the southern Kaduna killings which was and still is the bloodiest genocide in the history of Nigeria and the roles el rufai played? I know this is a joke right? Even as a joke that I know this is, I would have prefare somebody like Dankwambo of Gombe state to this worse than buhari fulani first born. El-rufai ke? God forbid bad thing. In other way round, Nigeria is established under falsehood and the constitution authenticates such,everything about Nigeria has rotten to the core so let nobody expect any change irrespective of whoever becomes the president or vice because the rotten system will change the changer…revolution is seriously needed or the false union called Nigeria be dissolved if restructuring will not be considered with immediate effect. LET THEM NOT DECEIVE US AGAIN,YOUTHS NEED TO BOYCOTT THE 2019 ELECTION. Wolves in sheep clothing’s, we Nigerian can never be fooled again, you can only fool you followers.